Construction of the chariots for Puri Jagannath Rath Yatra, or Car Festival, begins on the Akshaya Tritiya Tithi. 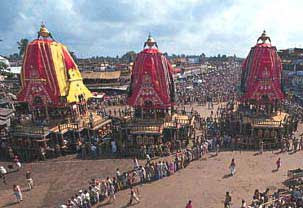 Each year three new Rathas (chariots) are made for the ceremonial journey of Lord Jagannath, Balabhadra and Subhadra. The chariot making begins on the on the Grand Road of Puri Jagannath Temple on the third day of the Vaisakh or Baisakh month. The chariots are completed in less than 60 days. The three chariots used in the Puri Jagannath Rath Yatra have specific size and dimensions and are a classic example of indigenous carpentry and engineering. You can find more details about the sizes and other measurements of each chariot in this article – the size and dimensions of the Puri Jagannath Rath Yatra chariots. No scales or measuring tapes are used by the carpenters for measurements. Instead the carpenters use their hands and fingers to build the giant chariots. Each year nearly 1000 trees are felled for the making of the chariots. Equal number of trees are also planted each year under the Sri Jagannath Bana Sankalpa Program. There was a suggestion to reuse the woods used but it was opposed by the priests and by a section of Jagannath devotees. Currently the woods are dismantled after the end of the Rath Yatra and are used for cooking the Mahaprasad. How to identify the chariot of Lord Jagannath? How to identify the chariot of Lord Balabhadra? How to identify the chariot of Subhadra?